Our very exciting club weekend takes place on Saturday and Sunday this weekend, 2nd and 3rd June! SATURDAY will see traditional musicians – both young and experienced, amateur and professional – entertain us all at Harlequins from 8pm-11pm…..the night goes on as long as you want it to! Then on SUNDAY the Club Day runs at Musgrave from 12-3pm. There’ll be BBQ, facepainting, games, the traditional Oul Lads/Coaches v Seniors game….and much more for all the family! 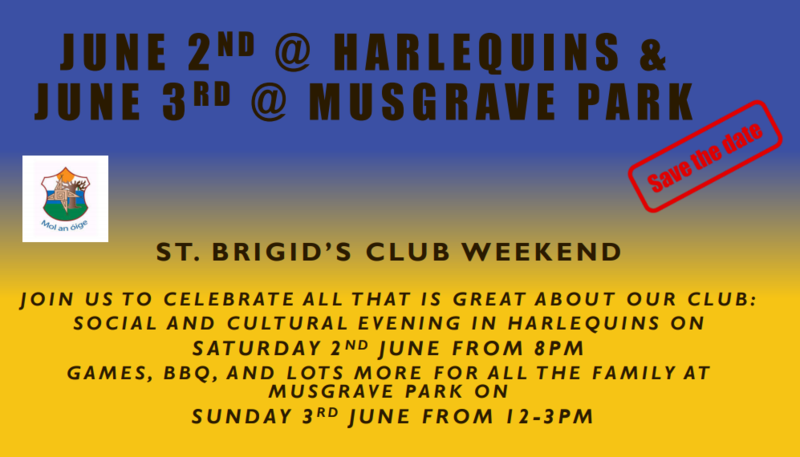 It promises to be a terrific weekend to celebrate our 20th year as a club — and we hope to see you along for a bit of craic at some stage over the weekend!